A superb defensive rearguard by Luton Town saw them make it four wins on the bounce with a hard-fought 1-0 victory at Leyton Orient this afternoon. Given the lead on 26 minutes by striker Jack Marriott’s wonderfully impudent finish, his 12th of the season, Town then came under something of an aerial barrage after the break, put under severe pressure by the O’s, who took every opportunity to launch the ball into the box. 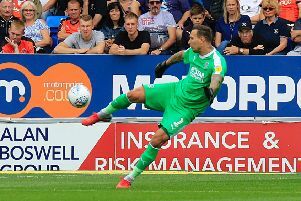 But the visitors, with new keeper Jonathan Mitchell impressing greatly on his Town debut and captain Scott Cuthbert producing a truly magnificent personal display, clearing everything that came his way, Luton hung on with what was a growing assuredness. To single out those two would be unfair on the rest of the side too, as each gave a shift to be proud of as although boss Nathan Jones wants to build a team that dominates games, he will be just as proud to witness they can the ugly side of the game too and do it well. The manager made two changes to the side that beat Morecambe 1-0 as Mitchell came in for Mark Tyler with Dan Potts replacing the injured Jake Howells, to play his first game since October 24. Hatters looked to utilise Craig Mackail-Smith’s pace in the early moments, with the striker forcing O’s keeper Alex Cisak to race out of goal and head away. The forward was then picked out by an inch-perfect Stephen O’Donnell cross, but after looking like he was shaping to volley, took a touch, only for he, Cameron McGeehan and Jack Marriott to all get in each other’s way as Orient cleared. With 20 minutes on the clock, a short corner routine saw Marriott drag wide of the post despite having more time than he might have thought. League Two’s leading scorer Jay Simpson wasn’t getting too much change out of Cuthbert and Alan Sheehan in the opening half hour, who marshalled him expertly, his one effort well wide of Mitchell’s goal. The deadlock was then broken on 26 minutes, courtesy of another marvellous goal by the visitors as Mitchell’s long clearance was flicked on by Mackail-Smith and Marriott escaped the attentions of the home defence to loft a chip over the back-pedalling Cisak. It was the striker’s fourth goal in five games and a 12th of an increasingly impressive season as he drew level with McGeehan as the club’s leading scorer. The hosts were then dealt a blow as Mitchell came out to punch clear a cross only to clash heads with Shaun Brisley, who after a good five minutes of treatment, was eventually stretchered off. That led to a tetchy passage of play as Potts earned a talking too, while McGeehan escaped a booking, with Luton’s modicum of control coming to with O’s coming to the fore, Ollie Palmer nodding over. Mitchell was then extended fully, with Jerome Binnom-Williams dancing past two tame Jonathan Smith and Olly Lee challenges to shoot with the outside of the boot, the new keeper holding on well. After the break, it was something a scrappy affair early on, but Hatters were doing well out of possession, something Jones has been striving for, keeping their hosts at arms length. O’s brought on Armand Gnanduillet for Palmer as the hosts piled on their first real spell of prolonged pressure, Sheehan getting a crucial intervention to stop the sub from scoring. Cuthbert made another crucial block, as Jones reacted to O’s pressure by bringing on Pelly Ruddock Mpanzu for Paddy McCourt. With 67 minutes on the clock, Hatters almost had a second as a home clearance fell perfectly for Potts, whose right footer just didn’t have enough curl on it as it flew inches past the post. O’s then came back strongly for the final 20 minutes, sending ball after ball into the Town area. Chances were fleeing though, Nolan just unable to turn sub Calaum Jahraldo-Martin’s header in, while Mitchell showed fine handling to claim fellow replacement Armand Gnaduillet’s vicious attempt. Hatters stood firm though, led by Cuthbert as it’s to their credit that Mitchell, bar a few crosses he confident came for, had very little to do in the final period. At the final whistle, Jones went over to acclaim the 1,400 travelling fans, with another display of roar passion lapped up by the visiting faithful, who are now starting to believe that Town’s season might not be over as prematurely as first feared, as they now trail the top seven by just three points. Hatters: Jonathan Mitchell, Stephen O’Donnell, Dan Potts (Magnus Okuonghe 86), Scott Cuthbert (C), Alan Sheehan, Jonathan Smith, Olly Lee, Cameron McGeehan, Paddy McCourt (Pelly Ruddock Mpanzu 66), Jack Marriott (Danny Green 76), Craig Mackail-Smith. Subs not used: Elliot Justham, Paul Benson, Joe Pigott, Alex Lawless. Os: Alex Cisak, Sean Clohessy, Mathieu Baudry (C), Ollie Palmer (Armand Gnanduillet 60), Sammy Moore (Calaum Jahraldo-Martin 67), Nigel Atangana, Shaun Brisley (Jobi McAnuff 37), Jerome Binnom-Williams, Jay Simpson, Nicky Hunt, Kevin Nolan. Subs not used: Charlie Grainger, Connor Essam, Jack Payne, Bradley Pritchard. Booked: O’Donnell 30, Mackail-Smith 89, Mitchell 90. Hatters MOM: Scott Cuthbert. Defender produced a superb display as Luton handled Orient’s aerial bombardment.